The weigh-in weighed against Dad yesterday, which is why he came home looking like he’d mistaken the produce man for the Brinks driver and knocked over the wrong truck. Lettuce … cauiflower … apples … oranges … radishes … celery. I guess panic made him forget he hates celery. Big Guy, meanwhile, rushed out of the room with an “ewwwwwwww” before the begeball taint could touch him. Hard to believe this was the kid who, two years ago, begged for salad and “dranch” in his lunch. Two kids, but one big difference in upbringing. Big Guy’s caregiver his first year would dump the vegetables at the first sign of a squirm and feed him fruit and milk only for weeks on end. That’s why I changed caregivers. I fear I was too late. There’s also a nature vs. nuture component coming into play, though, because the guys each reflect a parent. 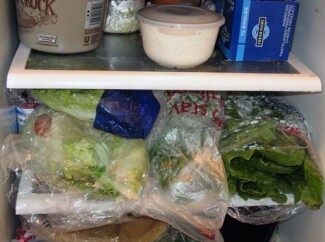 Little did Dad know, but the salad fixings he hauled in yesterday already were here. I’ve been shoveling them in since Christmas, as my body rebelled from weeks of baking and carb-loaded recipe testing. Dad turned to them only out of panic. It’s a hard thing to do, to train your body to send the right signals. For years, I fought the “ewwwwwww” reaction on a number of things grown in the ground, though I never had a problem with peas, broccoli or carrots. The rest I ate but not enthusiastically, because thought the only way to serve them was drowned in butter or lard. But then I discovered roasted cauliflower and grilled asparagus. Baked sweet potato. I learned that pinto beans, the old hillbilly standby, are not bad either if you simmer them in onion and spices instead of boiling them in fatback. And I found that chef’s salads are as close as you can come to perfection in one bowl. OK, so that’s not strictly a plant, but if you load it with garbanzos, bell peppers and lean turkey, you can justify a dollop of dressing. How to deprogram Big Guy’s “ewwwwwwww” response, I don’t know. His obstinate streak doesn’t help — he’ll go to bed hungry rather than eat anything on the dinner table. Thus far, he’s managed to stop just this side of starvation. But I know I have to keep trying. I’m hoping having Dad on board will help. Maybe they’ll both be snackng on celery by the end of the week. I’ll keep the dranch dressing on hand just in case. Copyright 2008 Debra Legg. All rights reserved. My oldest son eats vegetables and actually loves certain ones. My youngest … well let’s just say I’m happy he’s off the all-graham-cracker diet. Peanut butter sandwiches are an exotic mix of things for him. I grew up LOVING veggies – tomatoes especially. Since being pregnant, I avoid that section. Such a strange turn of events — hopefully, temporary. Sounds like our family reversed! Tomatoes are actually the one veggie I’m pretty sure I’ll never make peace with and, ironically, they’re one of the few things I’m completely nonallergic too. I love any tomato-based sauce, though. Marinara, taco, salsa. Go figure! Oh, and pregnancy aversions: I developed one to French fries when I was pregnant with Big Guy. I’ll eat them a bit now, but I just don’t love ‘em like I used to. Best of luck with the tomato thing. Wow. He’s getting good. When did that happen?